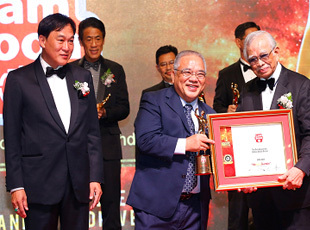 Mr. Kuek Bak Heng, LSEO Senior Executive Director is the recipient of this year’s Brand Laureate Award for FMCG Man of the Year. Mr. Kuek is instrumental in bringing success to many younger brands of Lam Soon such as Antabax and Naturel. He also created new milestone by leading the company’s revenue to exceed RM1 billion through product and business diversification. Mr. Kuek’s leadership and commitment to Lam Soon Group has brought him near four decades of success and he continues to drive our brands passionately. During the award presentation night on 10 Feb 2015, besides FMCG Man of the Year, LSEO also won Billion Dollar Brand Award, Platinum Brand Award – Knife brand and Signature Brand Award – Antabax, Lam Soon is the biggest award winner, hauling 4 prestigious awards in total.